It’s fast approaching, folks. For many of us, Mother’s Day is that one acknowledgment we get (not that we’d ever need more!) for working so hard all year long. I have high expectations every year, and every year my husband has to run out Sunday morning for “an errand”. Ugh. If your husband (or kids) are anything like mine, perhaps they need a little help in the gift area. Our celebrations range from a homemade card to a gift I (so subtly) hinted about, but this year I’m dreamin’. While the ideas below are specifically items I like, the categories themselves can be quite applicable to all. Let’s begin. Africa (This is my dream, remember?) Perhaps the ol’ safari isn’t in your plan or budget this year, but a night out or a weekend away is always welcome for moms! I love flowers just as much as the next girl, but might I suggest a flowering shrub instead of a cut arrangement? The giver, of course, would have to offer to plant it, but it would get much more use and flower for years to come. Women love shoes. For me? It’s rain boots. Aqua rain boots, thank you very much. Bags, purses, clutches, etc. This lovely camera bag has been on my drool list for some time now. It wants me to own it. I can feel it. How about some art work? It could be personalized or something significant to your family. As for me, I just really need something summery over my mantel. Another item that’s been on my list for a while. Jewelry gets a list all to itself. I’m not even much of a jewelry wearer, but I do like my pieces to be show stoppers when I wear them. Rings. These diamond encrusted cross rings are so dainty and simple. The diamonds aren’t real, so it’s affordable and still meaningful. Personalize it! I love sentimental jewelry that doesn’t say sentimental. You pickin’ up what I’m layin’ down here? I know that it means something, but YOU don’t have to know that it means something. A simple initial is the perfect touch. How ’bout something trendy? Arrows and stack jewelry are pretty popular right now. Why not just buy mom something fun and fashionable? It doesn’t have to be earth shattering to say you were thinking about her when you picked it out. Ok. These are my favorite. You and your kids could sit down and come up with words that describe mom–ya know, funny, skinny, drop dead gorgeous, whatever–and have a bracelet engraved with each description of her. How thoughtful is that?! And it helps that the stack bracelets are so yummy. So there you have it. 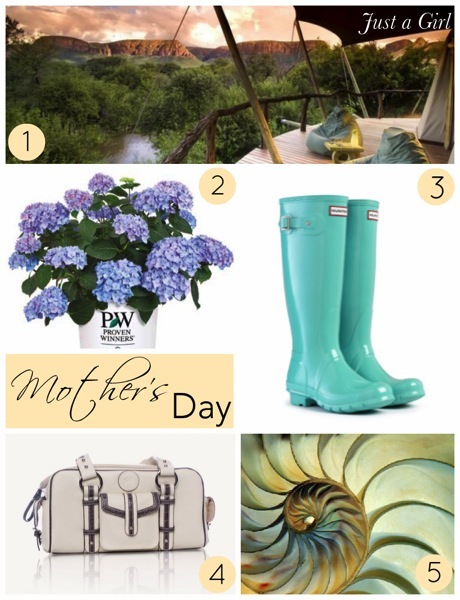 My complex list of items I’d LOVE to receive for Mother’s Day. What am I missing? A new car? A dinner that doesn’t involve chicken nuggets? I guess we all have our favorites, eh? You are so cute! 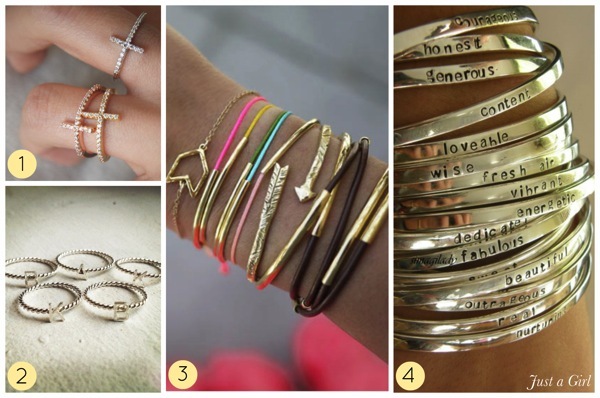 I’d really love one of those initial rings. One year my daughter and son-in-law took me out to a fondue restaurant and we just ordered 3 different kinds of chocolate fondue with all kinds of yummy things to dip into it. I don’t know who had more fun by the end of the night – my hubby or my grandson smearing chocolate on each other. All fattening gifts aside, I think my favorite Mother’s Day gifts was the ones I received in 2003 and 2007 when my daughter told me she was pregnant with my first and second grandchildren. Both times she chose to give me the news in a Mother’s Day card and both grandsons were born the following January – 4 yrs apart.